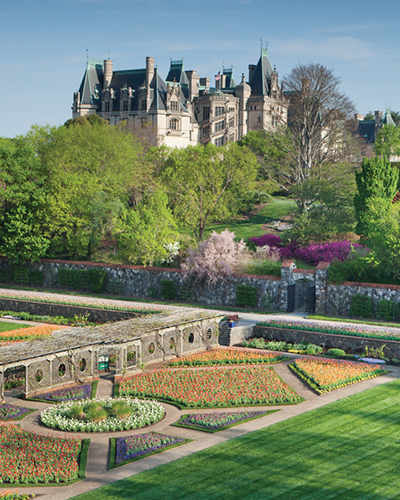 Vibrant blooms and stories of grand Vanderbilt-era celebrations welcome you to Biltmore in remarkable style this spring! From the ever-changing display of colorful blossoms known as Biltmore Blooms to our elegant exhibition in Biltmore House, A Vanderbilt House Party – The Gilded Age, there’s so much to see and do during this glorious season of renewal. Save up to $10 on each admission ticket when you book seven or more days in advance! Experience America’s Largest Home® in an entirely new way! 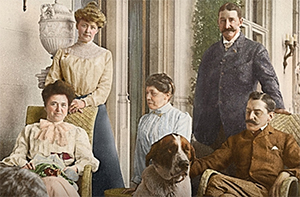 For the first time, reproductions of clothing from the Vanderbilts’ wardrobes are displayed in the settings in which they were originally worn: the elegant rooms of Biltmore House. Free with online admission purchase, our Exhibition Audio Guided Tour combines 360° sound techniques with behind-the-scenes stories that allow you to imagine you are there as guests and staff prepare for a gala celebration. 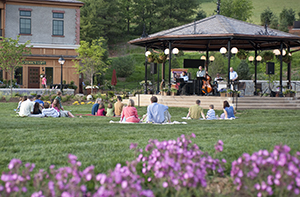 Charming Antler Hill Village, where you can enjoy live music daily, is the perfect place to relax and unwind after a busy day on the estate. Sample award-winning wines and delectable cheeses, chocolates, and charcuterie at the Winery’s beautifully appointed wine bar. Visit the Farmyard to pet the friendly farm animals, browse our unique collection of shops, then cap off your time with us by enjoying fresh farm-to-table fare at one of our restaurants. Engaging tour opportunities include behind-the-scenes explorations of Biltmore House and the estate, and special tours and tastings at our Winery. For those interested in immersing themselves in Biltmore’s 8,000 acres, our Outdoor Adventure Center provides an abundance of ways to enjoy estate grounds. 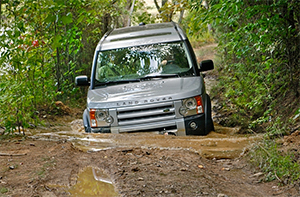 From biking, horseback riding, and carriage rides to sporting clays, falconry, and fly fishing, from Land Rover Experiences to Outrider USA Adventure tours, there's something for everyone! Dine with us this spring to delight in fresh seasonal flavors from Biltmore’s gardens and local farms! Farm-fresh ingredients range from tender lettuces and asparagus to estate-raised lamb and beef and artisan cheeses from area producers. 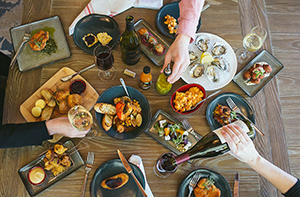 Inspired by this seasonal bounty, talented estate chefs devise menus thoughtfully designed to please a variety of palates while pairing perfectly with Biltmore’s handcrafted wines, signature cocktails, and craft beers.